Space is often the top priority in a garden or landscape, whether for private homeowners or commercial estate managers. 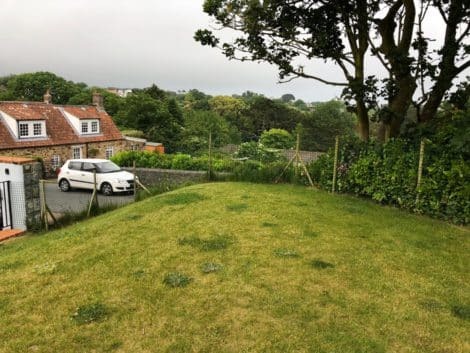 This client – a private customer of Auburn Gardens – has a property and rear garden towards the top of the south coast cliffs of St Martins, Guernsey. “In the design discussions with the client, it was clear that the boundary should make best use of the space without compromise. Timber fencing would have made the garden feel too closed in and there was additional considerations needed for security, low maintenance and ensuring that the family dog could also be contained.” said Jack Etheridge, owner of Auburn Gardens as he recounts the initial briefing to discuss natural screening alternatives. That meant EUONYMUS. 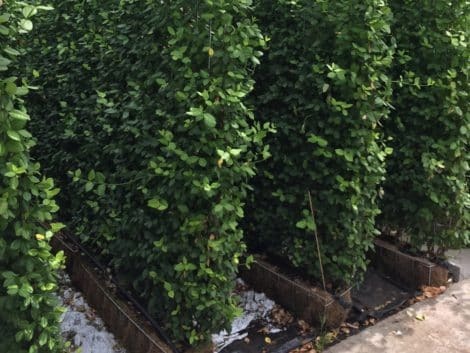 Selecting the Mobilane Euonymus Green Screens gave all the usual benefits of a natural screen without compromising space – and planted with the Euonymus Dart’s Blanket variety ensured ultimate hardiness in its breezy coastal aspect. 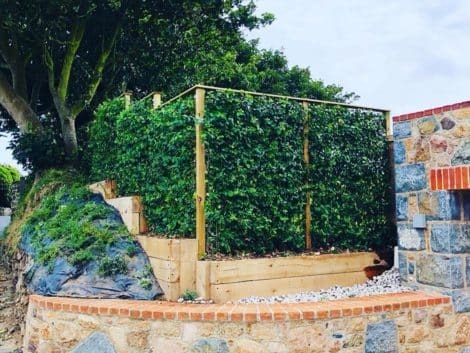 The banked garden would host 9 screens, measured and customised by cutting into varying heights by the Auburn Gardens team, a Guernsey-based landscape and design build company headed by Jack. 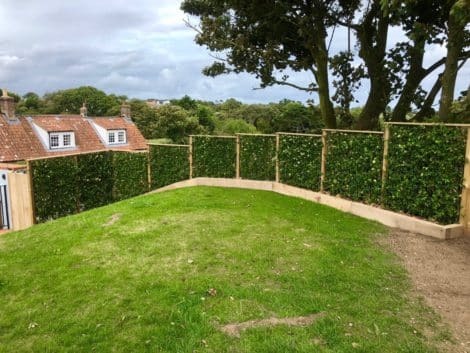 Jack and his team provide landscaping services across the island, with particular focus on green screens and environmentally-sustainable landscaping materials and products. Installed in mid August, the banked screens were installed within 5 days, including customising the planters and restructuring the garden bank itself. Due to the steep incline of the garden, the team had to reprofile the ground, completing all the soil excavations by hand for health and safety purposes. The posts this time had to be concreted in place to ensure ultimate stability to counteract the extremely strong winds experienced in the are. The planters were constructed around the screens to ensure the maximum volume of growing media for the healthy establishment and growth you would expect from Mobilane Green Screens. Both installer and client are extremely happy and complimented Mobilane on their consistently high Mobilane Green Screen quality – something Auburn Gardens both rely on and expect. And the resulting installation impressed within the local neighbourhood also, leading to 3 additional contracts gained by Jack within a week of its completion. Want to know more about these products?